POWERMAD – “THE MADNESS BEGINS…” IS A HUGE HEAVY METAL FIND ON VINYL!! POWERMAD – This Speed Metal meets Thrash Metal band formed back in 1984, hailing out of the great state of Minnesota. 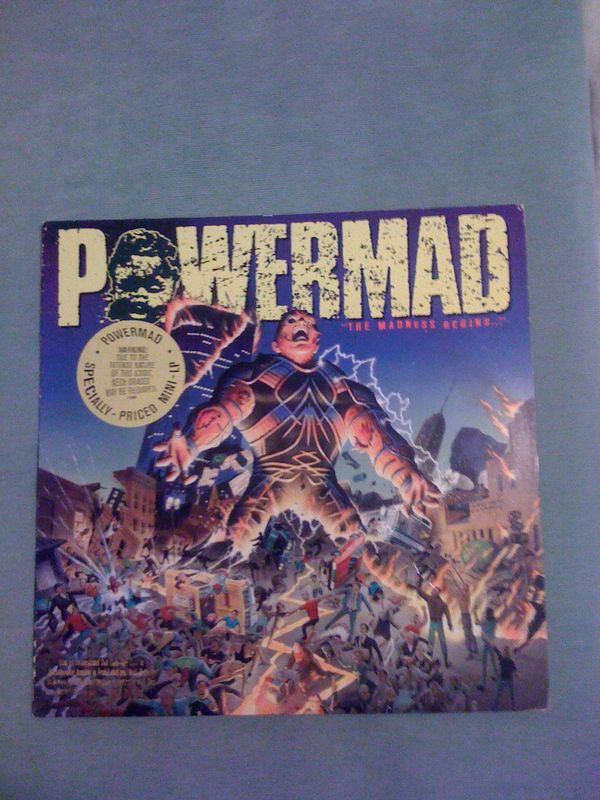 In 1986, Powermad released their self titled and debut EP on Combat Records. In 1988, Reprise Records picked up Powermad, releasing their EP – The Madness Begins… and this is the very EP that I found hiding in an antique co-op mall just yesterday!! (See pics of it below). Whoa. Whoa again, is how I first felt upon gazing my eyes upon this Heavy Metal super find! It’s Powemad… I thought to myself, thinking, can this be really happening? 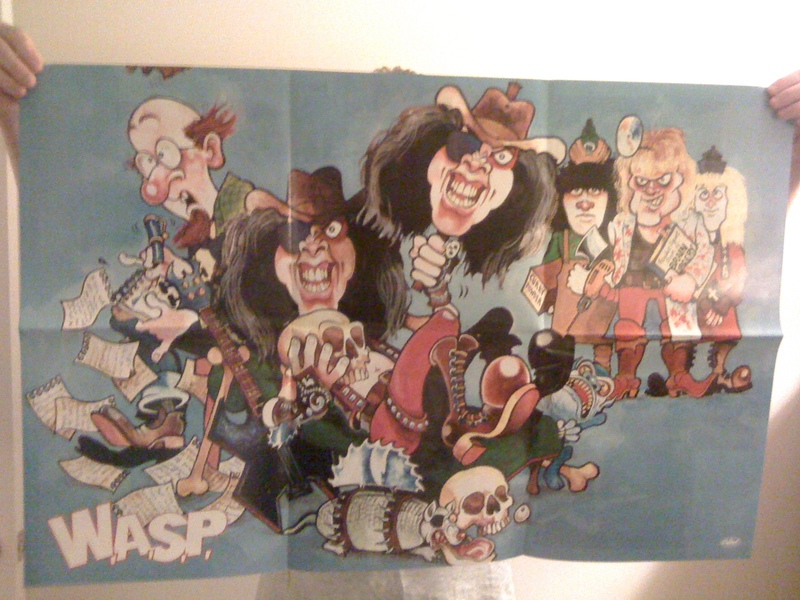 I am looking at and holding the vinyl EP copy of The Madness Begins…!?! 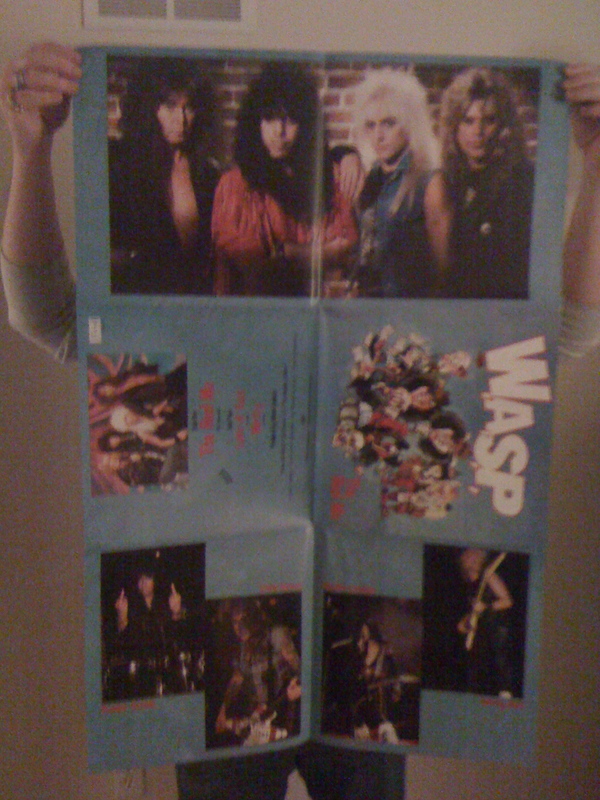 In Metal summary, as you can tell, I was extremely psyched out of my mind about this Heavy Metal find… and I still am. I paid a meager – $6 for this Powermad gem! Six dollars! The total condition of this Powermad EP is in excellent to near mint too! The top right and bottom corners of the album jacket are the only areas that show a tad of wear. Otherwise, the original gloss on both sides of the album jacket still literally shines on it! The original circular sticker is on the front side as well. The text printed on the circumference of the circle sticker reads: “Powermad Specially – Priced Mini – LP”. Specially priced alright, only six dollars, after more than two decades after it’s initial release… and it’s super, super, rare!! The inside text on the circle sticker reads: “Warning: Due to the intense nature of this music, neck braces may be required”. That’s vintage stuff… Old School. There are four songs on this EP, all four are Thrash Metal and Old School too. Upon my first handling of the actual vinyl record itself, I could not believe there were no visible signs of it ever being handled! (Unless someone really, really took great care of it in the past). Once I dropped the turntable needle down on this POWERMAD EP to play, the sweet sound of analog filled the air, with not a crackle or pop. Take my word for it, these songs are incredibly worthy of multi-multiple listens on a regular basis. Terminator is the opening track, it begins with thunderous drum beats in unison with vintage, heavy riffs that tell me immediately I’m in for a Metal treat. This song sizzles and then explodes into Thrash Metal glory. Joel Dubay on lead vocals has a coherent delivery, only watch out for his screach… he can hit the high note without any trouble and it’s superb. Hunter Seeker is faster than Terminator, it kicks right in where Terminator left off. This song is a rifftastic display of Old School Thrash Metal – period. I find this song rips, tears and burns each and every second… give me more POWERMAD please. Gimmee Gimmee Shock Treatment is the shortest song on this EP and it offers up some heavy grooves to go along with the Thrash. 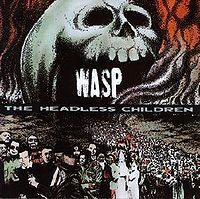 This is a Ramones cover song, a Thrashtastic version at that. It blisters along with all the fury one could wish for from a quality, late 1980’s Thrash Metal Band. Credible stuff. Blind Leading The Blind opens up with a spoken word, to the best of my Metal ears, it goes like this: “Your gonna do some praying for me now boy”. The voice of this spoken word sounds like an eerie backwoods hermit that you might bump into at a remote, country keg party. The backing, (gang), vocals on this song just screams Old School. Blind Leading The Blind is by far and large, the fastest song on this EP. Unreal great. Man, I couldn’t have asked for this POWERMAD EP to be in any better condition than this! You can see how it still bestows the original gloss on these front and back covers. * POWERMAD – The Madness Begins… was released in 1988 on Reprise Records. 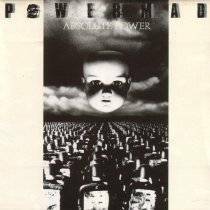 * POWERMAD released their only full length album in 1989 – Absolute Power, on Reprise Records. I don’t own a copy of Absolute Power… yet. I will find one though, preferably on vinyl… you betcha. * The 1986 self titled POWERMAD EP on Combat Records was released as part of the Combat Boot Camp Series, showcasing a heavy band’s demo. MASTODON – “DIVINATIONS” PICTURE DISC SINGLE IS A METAL MUSIC FIND! 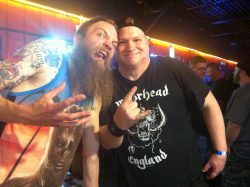 MASTODON. Hot Topic. What do these two Metal Music names have in common? 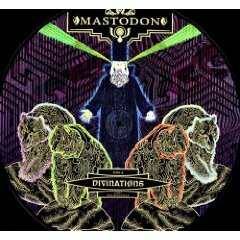 I recently, (last weekend), found the Mastodon – Divinations, 12″ picture disc single… at Hot Topic. Oh, that’s not all… this Mastodon picture disc single only set me back $2.54! That’s not a type-o… $2.54. Much cheaper than a pound of imported ham, currently selling at the local deli. (The original retail price for this picture disc runs around $14). You might query, as to how did I pay such a rock bottom price for this unreal great, Mastodon picture disc. Clearance racks RULE. As I entered Hot Topic, my wife informed me she was heading to the back of the store… to the clearance racks, was my Metal suspicion. It’s funny how I always become engaged by looking over the other stuff at Hot Topic, each time I go there, forgetting to hit the clearance racks first. The t-shirts, rings, vinyl album and CD racks never fail to distract my attention from those glorious clearance racks. I can always count on my wife to hone in on those racks of discounted Metal treasures though! It’s always a Metal thrill when you can score your favorite bands on the discount racks. This is not the first time we have found very cool vinyl, discounted at Hot Topic. Just as we were checking out at the register, one of the Hot Topic employees raced over to the discount racks where this Mastodon picture disc was found… this employee proceeded to nab the lone remaining copy of Divinations, as well as other assorted vinyl too. She said she wanted to make her move, before the discounted stuff was gone. I can’t blame her one Metal bit. We did pick up other discounted vinyl at Hot Topic that same visit… I will wait to blab about it on future posts because the finds are that unreal great. It’s always a great Metal treat, when the album artwork is brutal and hellishly unreal… fitting right in with the Death Metal theme. (Did I use the word treat back there?). 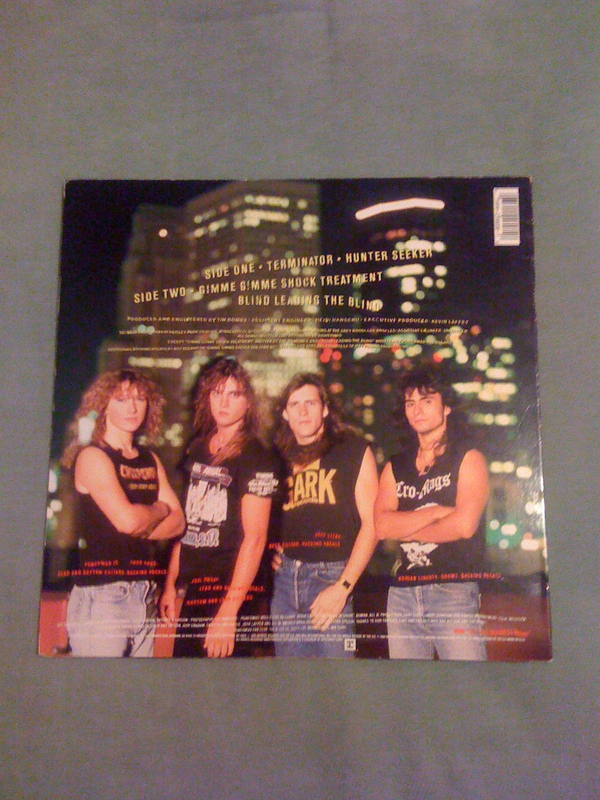 The back cover shows Kataklysm, in all of their Metal glory, from left to right: Stephane Barbe (bass), Max Duhamel (drums), Maurizio Iacono (vocals) and Jean-Francois Dagenais (guitars). The two songs on this picture disc, as well as every song on the Prevail album, are immensely dominant in all of it’s Death Metal extremity. 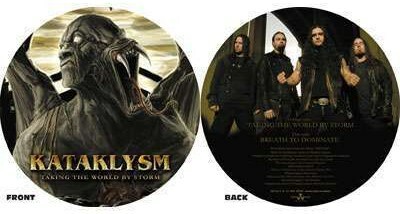 Kataklysm comes at you from all Metal angles… there really is no room to escape, all you can do is listen to their songs on this picture disc and their Prevail album and be set Death Metal straight. Kataklysm plays extremely tight and solid, with a flurry of Thrash Metal thrown around for good Metal measure. The riffs are abundant and very memorable, you can’t possibly listen to these Kataklysm songs without walking away with several riffs and leads – buzzing in your head. 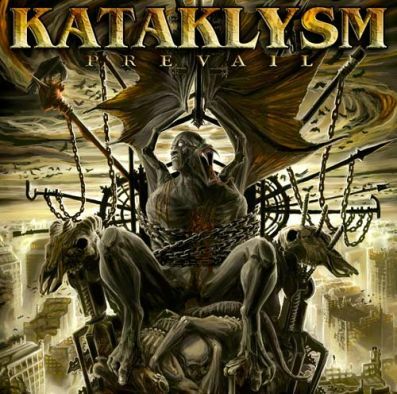 Even if you are not a fan of Death Metal, (I could never fathom not being a fan of Death Metal), this Prevail album from Kataklysm will certainly leave a long lasting dent in your skeptic attitude. Maurizio Iacono is without Metal question… one of the most underrated vocalists in not just Death Metal, in all of Metal. (That is my Metal opinion and I am sticking to it). Why is this Creeping Death picture disc considered a 1st issue? Answer: There is NO barcode found on side 2, the 2nd issue of Creeping Death HAS the barcode on side 2. 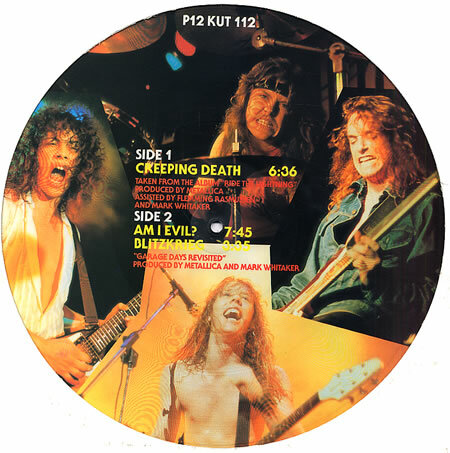 Those pics of Metallica on Side 2 of this picture disc are now… vintage. Kirk Hammett on the left, Lars Ulrich on the top, the late Cliff Burton on the right and James Hetfield on the bottom. Yup, Metal time does seem to fly. 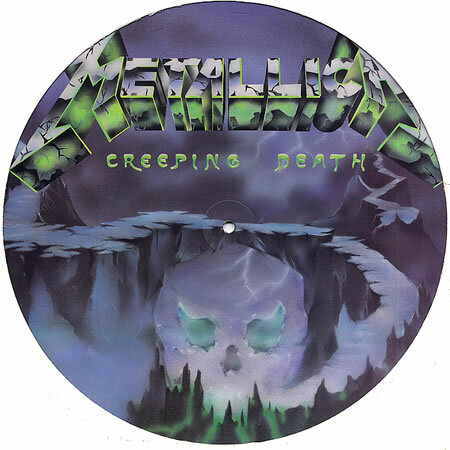 This Creeping Death picture disc was released sometime in 1984. (I just do not know the exact month/day of it’s 1984 release… I will continue my Metal research and update this post once I do know). Although it is not printed on this actual picture disc that I own, this is a U.K. release, on the Music For Nations record label – I have found this information upon my Metal research through the years. I am absolutely psyched, that this Metallica Creeping Death picture disc is still in my collection. As I delve further into it’s track listing, the Thrash Metal History just seems to come alive… as you read on, you shall see what I mean! Am I Evil? and Blitzkrieg were two songs labeled together as – Garage Days Revisited, (the above image of side 2, shows this). Creeping Death is from Metallica’s second studio album: Ride The Lightning, (released in July of 1984. 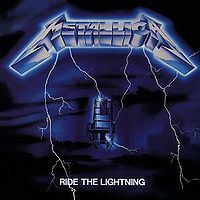 I can remember the first time I listened to this Ride The Lightning album, it was sometime back in 1984… I held onto and stared at the album jacket as the songs played on and I never felt more awe struck in my entire young life. Yes, I do remember trembling, upon my very first listen to For Whom The Bell Tolls… it was a listening experience so unreal, I can never forget it. Creeping Death, however, was/is just as sensational a song from Ride The Lightning as any of the others. Metallica Ride The Lightning – greatness never fades, it only grows stronger. Am I Evil? 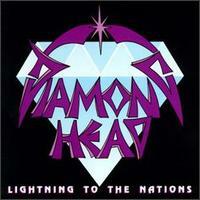 is the b-side single on Side 2, a song originally written and made famous by Metal legends… Diamond Head, from the Diamond Head 1980 debut album – Lightning To The Nations. Metallica’s cover version of Am I Evil? was only found on this Creeping Death 12″ picture disc, up until it was released on the Metallica album – Garage Inc., (a double album of cover songs), in November of 1998. 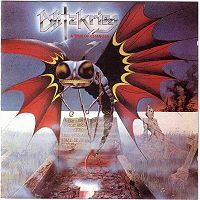 Blitzkrieg is the second cover song on side 2, a song originally written and released by the Heavy Metal band – Blitzkrieg. This song was originally released in 1981, on the Blitzkrieg 7″ single – Buried Alive. The song Blitzkrieg was later released on the Blitzkrieg 1985 album – A Time For Changes. So there you have it, some Thrash Metal and Heavy Metal History surrounding the 3 songs found on this Metallica Creeping Death 12″ picture disc. I find it of Metal importance, to understand where the songs originally came from… and from what band and/or album. Die hard fans back in 1984 knew who Diamond Head was for sure, yet for Metallica to also embrace a song from Blitzkieg and make it work as a Thrash Metal cover, just magnifies the brilliance that Metallica created together as a band. To just listen to a song is one thing, to know the linkage of a song makes it all the Metal better… it’s called Metal roots, Metal history. 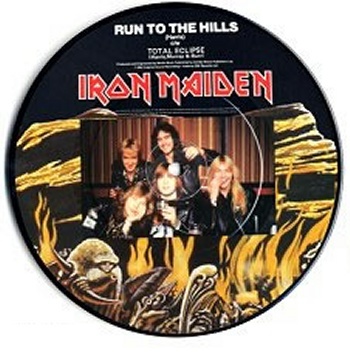 IRON MAIDEN “RUN TO THE HILLS” PICTURE DISC – AN ANTIQUE STORE FIND! Heavy Metal memorabilia and records can be found in antique stores… and why not? Heavy Metal does go back at least four decades, for sake of argument. I am a collector, of various things… probably too many things! Oh well, you only live once. One of my favorite “things” to collect are Heavy Metal picture discs, records that are adorned with graphics/photos and artwork. 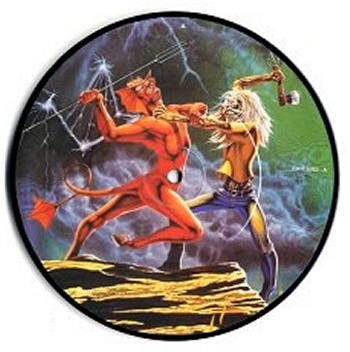 These Heavy Metal picture discs bestow the images that are usually tied into the band itself, being the band’s logo and/or mascot and at times the album or song’s theme. The images on these type of picture discs are often times attention grabbing. Heavy Metal picture discs always have been and still are intended to catch your eye, therefore making the respective picture disc into a collectible you display, more than the record you play. Price Paid – $10 (U.S.) – this price is just unreal good for me! Age of Picture Disc – 28 years – yeah, I cannot believe it’s been that long. * Run To The Hills is found on the original 1982 and 1995 reissue version of The Number Of The Beast album. * Total Eclipse being the b-side to this picture disc, was not on the original 1982 album The Number Of The Beast. Total Eclipse was later included in the reissue version of The Number Of The Beast, released in 1995. The 1998 reissue and the 2002 ECD version also include Total Eclipse as well. Check out the front and back artwork of Derek Riggs on this sensational Iron Maiden Run To The Hills 7″ picture disc below. The photo of Iron Maiden shows, from top left to top right, Adrian Smith, guitarist and Steve Harris, bass guitarist. The bottom row, from left to right, Clive Burr, drummer, Bruce Dickinson, vocalist and Dave Murray, guitarist. Man, I always seem to find the coolest Heavy Metal collectible when I least expect it. You know something… I am sick and tired of the throw away mentality that surfaces about, in regards to the media in which we listen to music. Turntables are still being sold and so are cassette tape decks. I can understand if younger generations are not at all interested in vinyl records, cassette tapes or (gulp) – 8-track tapes. The younger dudes did not have record or tape collections to replace with CD’s… a very costly endeavor at that, which can take a lifetime to rebuild with CD’s, depending on how large your music collection was. However, in the last three years alone, I have purchased two “brand new” combination stereo systems for my daughters and guess what? Both of these combination stereos have built-in cassette decks!! Both stereos were purchased at Target, a major upscale department store that is supposedly in the know – on the cutting edge of having the latest home electronics technology! So, if cassette tapes are supposed to be so archaic, so outdated and symbolic of poor taste in music listening enjoyment, then why are they still being manufactured? To pacify us older dudes who have still hung on to our cassette collections? 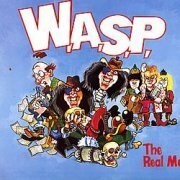 Out of sympathy for us nostalgic Metalheads? There are dozens of Heavy Metal cassettes that I find that are currently not available on CD. The cassettes I buy must have the original liner notes intact, in near mint to mint condition. Take my word for it, these liner notes are a piece of Heavy Metal nostalgia for the respective band on the cassette… I still get a kick out of reading the cool liner notes that have full lyrics and interesting credits. You would be surprised at what one may learn from reading the liner notes of these old cassettes… especially the ones that are currently not available on CD. I have posted in the past, the last laugh the turntable and record albums are currently having on the music marketplace… it is the Heavy Metal cassette tape that is silently having the last laugh as well.